In small bowl, combine 2 tablespoons water and gelatin; let stand 1 minute to soften. In small saucepan, combine sugar, 1 1/4 cups water, milk and softened gelatin; cook and stir over medium-high heat until mixture boils. Remove from heat; stir in almond extract. Pour mixture into ungreased 8-inch square (2-quart) baking dish. Refrigerate about 2 hours or until mixture is set. To serve, cut pudding into 16 squares. Spoon orange segments and pineapple into 8 small bowls; top each with 2 pudding squares. Store any remaining pudding in refrigerator. This refreshing almond-flavored pudding must be prepared at least 2 hours in advance. When set, cut it into squares and return it to the refrigerator until serving time. 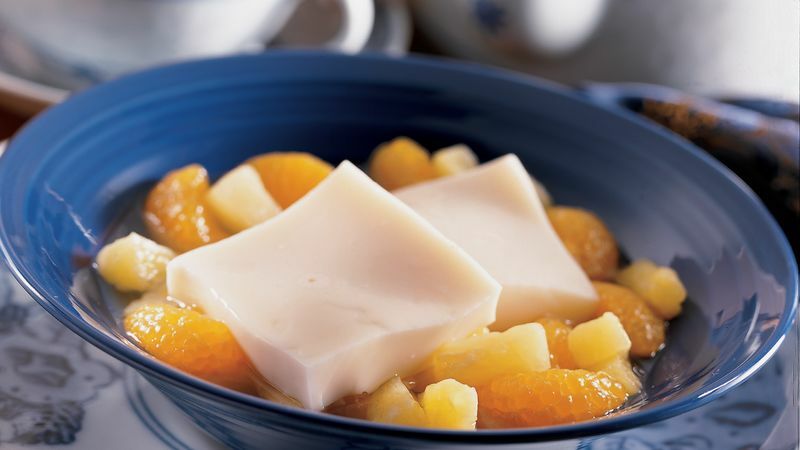 Try canned litchis, gooseberries, blackberries or loquats in place of the mandarin oranges and pineapple.